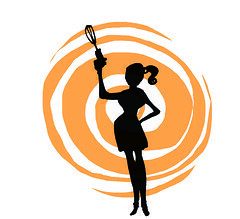 My very first Daring Baker’s Challenge!!! 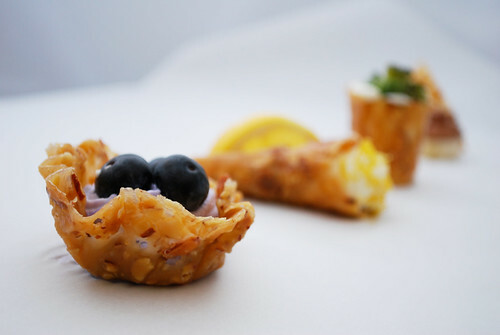 I was SO excited to create these yummy little tuile treats for my very first Daring Baker’s Challenge! It was a super fun challenge, and created a HUGE mess in my kitchen, and burnt my finger really super bad on the sugar, but well worth it at the end of the day. I’m a couple days late in posting this, because work was caarrrrrrrrazy this week….but I finally got to it, and hope you all enjoy it. 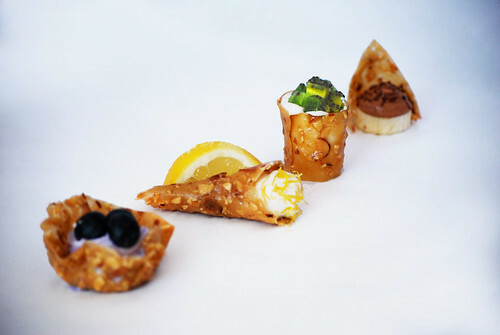 Please find the recipe for the Nougatine Tuiles below. 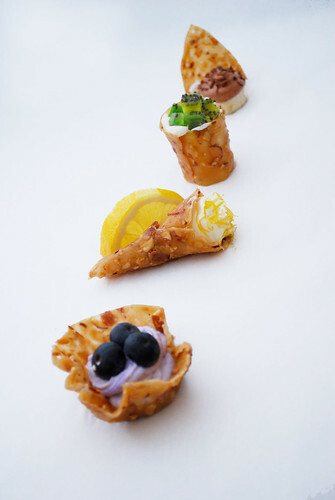 I made four different “shapes” for my tuiles…and accompanied them with four slightly different variations on a theme. I did a flavored mousse for each shape. 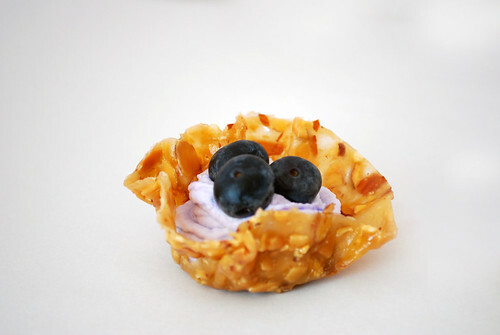 The little cup was filled with a blueberry mousse, and topped with fresh blueberries…MMMmmm! 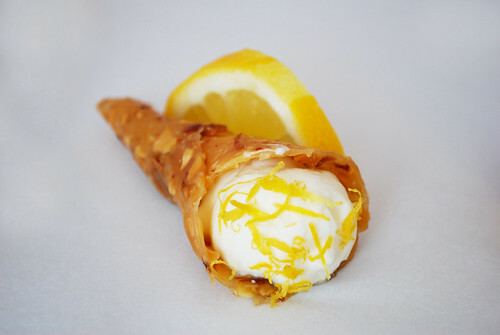 The cone shape was filled with a lemon mousse, and topped with some fresh lemon zest, and garnished with a slice of lemon. 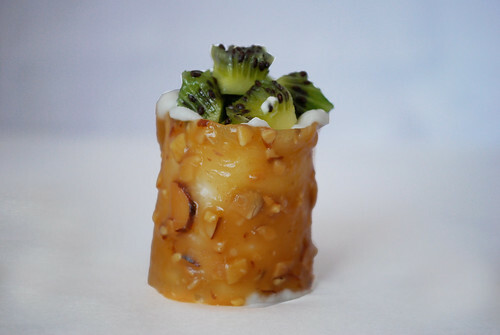 The circle ring shape was filled with a white chocolate mousse and topped with some fresh diced kiwi. 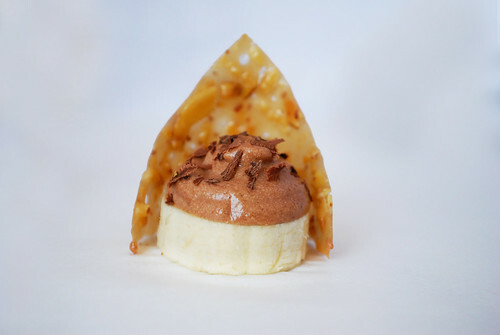 And finally, the little triangle tuile was accompanied by a slice of banana, topped with a chocolate mousse and some bittersweet chocolate shavings. YUM! YUM! LOVELY, i want to try the lemon one! Don’t tell me you took those pix with your new camera. They are professional looking! YUM. When is the party?